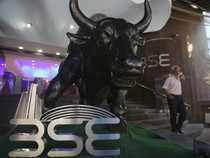 NEW DELHI: The domestic equity benchmark BSE Sensex was trading 101.79 points up at 38,964.02 on account of buying in frontline bluechip counters. Shares of Manaksia Aluminium Company (up 19.14 per cent), Lancor Holdings (up 18.36 per cent), Womens Next Lounge (up 17.24 per cent), Gujarat Hy-Spin (up 14.04 per cent), Amal (up 12.69 per cent), Shetron (up 12.64 per cent), Vishal Fabrics (up 12.44 per cent), Danlaw Technologies (up 11.79 per cent), Radhe Developers (up 11.60 per cent) and Reliance Industrial Infrastructure (up 11.32 per cent) were among the top performers. Indiabulls Real Estate (up 10.99 per cent) and Jai CorpNSE 9.31 % (up 9.95 per cent) too were trading 9-10 per cent higher at around the same time. The Nifty 50 index was trading 18.55 points up at 11,684.50. Among the 50 components in the Nifty index, 32 shares were trading in the green, while 18 were in the red.